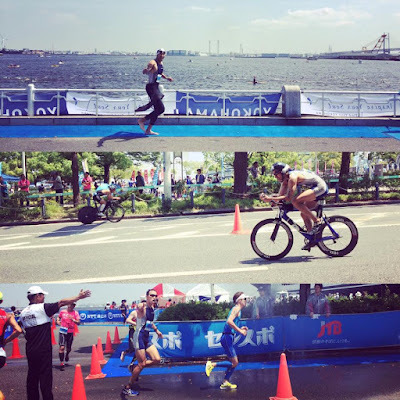 My first test of the season was Yokohama triathlon. the bike transition (the hazards of big city races). The bike course is very technical with 2 hairpin turns. That is actually an improvement from 4 years ago. It was windy and there are hills as well. run as a consolation for running 800 meters out of the water. gun sounded and it was a rather smooth deep water start. but careful not to overexert my tender left shoulder. before swimming back to base for the 2nd lap. I didn’t have a watch on so no idea what my 1H split was. the first turn you had a back wake which made it easier. of the water in 29:33, pretty damn slow. I usually do 25 minutes. in 1:07, not bad for that kind of course and wind. My total bike time was 1:14:16 including the 2 transitions. which felt just fine. I aimed for a 43-44 minute run. family, NAS, nanbanners, which helped a great deal. down the bay line with nice views and one difficult ramp. 42 minutes. Run officially was 41:49.
age group, I finished 16th out of 165, or top 10%. for getting out of bed early and coming down to the race! And all the supporters out there were fantastic. As far as the race course goes, I have mixed feelings. supporters from Tokyo and Yokohama. hilly. The run is the only part without any major obstacles.